A Sting in the Tale, Dave Goulson's account of a lifetime studying bumblebees, was a powerful call to arms for nature lovers everywhere. Brilliantly reviewed, it was shortlisted for the Samuel Johnson Prize for the best nonfiction book of the year, and it debuted the already renowned conservationist's ability to charm, educate, and tell an absorbing story. 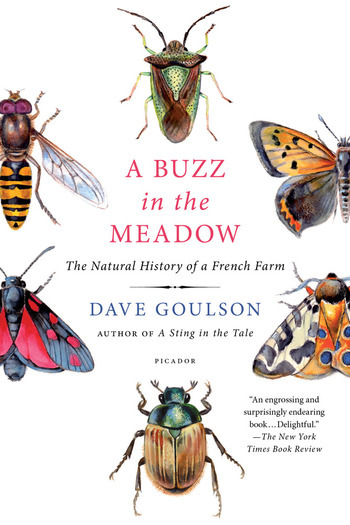 In A Buzz in the Meadow, Goulson returns to tell the tale of how he bought a derelict farm in the heart of rural France. Over the course of a decade, on thirty-three acres of meadow, he created a place for his beloved bumblebees to thrive. But other creatures now live there too, myriad insects of every kind, many of which Goulson had studied before in his career as a biologist. You'll learn how a deathwatch beetle finds its mate and why butterflies have spots on their wings, and you'll see how a real scientist actually conducts his experiments. But this book is also a wake-up call, urging us to cherish and protect life in all its forms. Goulson has that rare ability to persuade you to go out into your garden or local park and observe the natural world. The subtle glory that is life in all its forms is there to be discovered. And if we learn to value what we have, perhaps we will find a way to keep it. DAVE GOULSON studied biology at Oxford University and is now a professor of biological sciences at the University of Stirling. He founded the Bumblebee Conservation Trust in 2006, whose groundbreaking conservation work earned him the Heritage Lottery Award for Best Environmental Project and "Social Innovator of the Year" from the Biology and Biotechnology Research Council. His previous book, A Sting in the Tale, was a Seattle Times Best Book of the Year, and shortlisted for the Samuel Johnson Prize.